Periodontal Disease, also known as gum disease, is caused by bacteria in dental plaque. In an effort to get rid of the bacteria, the cells of your immune system release substances that inflame and damage the gums. This leads to swollen, bleeding gums, a sign of gingivitis (the earliest stage of periodontal disease). Damage from periodontal disease also can cause teeth to become loose. This is a sign of severe periodontitis (the advanced stage of disease). In recent years, gum disease has been linked to other health problems. This is a new area of research and many questions remain, but findings have shown that visiting your dentist regularly along with daily brushing and flossing could help your overall health, rather than just your oral health. 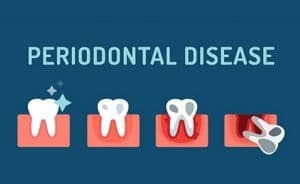 You can prevent periodontal disease by practicing good oral hygiene and visiting your Dental365 dentist regularly. Most people should see the dentist every six months, but if you already have gum disease you may need to visit more often. Daily brushing and flossing, when done correctly, can help to remove most of the plaque from your teeth. Professional cleanings by your dentist or dental hygienist will keep plaque under control in places that are harder for a toothbrush or floss to reach. If you are due for a cleaning, call Dental365 today at 844-365-DENTAL. Our professional and friendly staff will get you into the office quickly and on the right track to overall wellness.